The Spring, Summer 2017 Charles Youssef show at New York Fashion week put an interesting twist on what is usually a highly exclusive event. Using virtual reality, the designer invited fashion and beauty fans from all walks of life to see how his collection was styled. This behind-the-scenes peek gave us a first look at the new must-have up-do by the legendary stylist Orlando Pita, New York Fashion Week Ambassador for TRESemmé. To complement the delicate motifs and flowing romance of Youssef’s Spring, Summer collection, Pita worked with natural texture to create the half up, half down twisted bun. The relaxed vibes of this style were the perfect accessory for Youssef’s collection, but it’s also a great way to add a tousled edge to any laidback spring look. Softness is the key to achieving a romantic finish. Start by washing your locks with TRESemmé Botanix Nourish and Replenish Shampoo and conditioner to help moisturize and smooth the hair shaft before styling. Part your hair vertically down the center, then again horizontally from ear to ear. 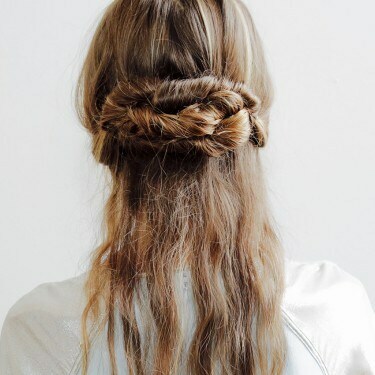 For now, pull the lower half of your hair into a pony to keep it in place. You can now free your hair from the low pony. Tip: Apply TRESemmé Heat Defense spray and create gentle 'S' waves using a flat iron if you need more movement. Tame any frizz with your favourite hair spray to complete an effortlessly chic look.